Haley Prater, the recipient of The NIAF Marnell Foundation Scholarship in 2014-2015-2016, had the opportunity to attend and volunteer at this month’s NIAF 41st Anniversary Gala Weekend. Haley blogged about her experience on her personal blog, but we’ve decided to share it here for all of our followers to see one young woman’s experience of our Gala Weekend. The National Italian American Foundation (NIAF) held their 41st Anniversary Gala on Saturday, October 16, 2016 in Washington DC. As a three-year recipient of the NIAF Marnell Foundation Scholarship, I was invited to volunteer at the event, and I finally made my way out to D.C. in my last stretch of college. 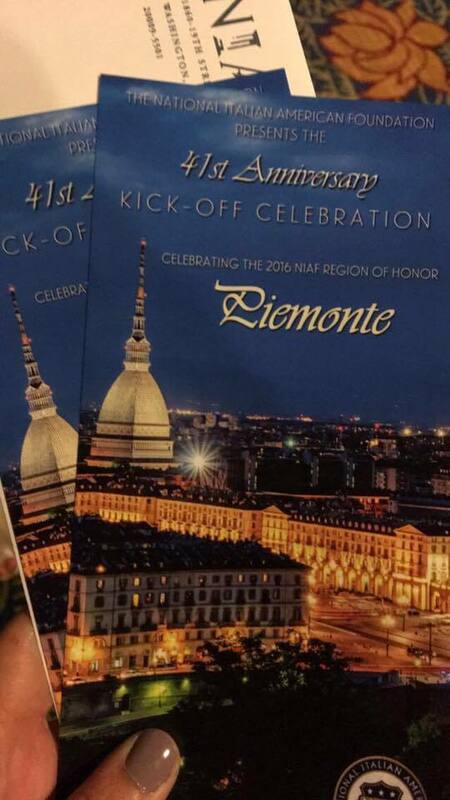 The NIAF Region of Honor this year was Piemonte and I lived in Torino (the capital of Piemonte) for a year so I couldn’t contain my excitement. Considering the fact that my family is very proud of our Italian heritage, and I have worked myself to the bone in an attempt to keep my scholarship, this weekend was the opportunity of a lifetime. D.C. was beyond my expectations. I hadn’t felt this at home in a city since I was touring cities for college; it is one of the only cities I’ve visited (besides Paris and New Orleans) where I could see myself living there and being happy for years to come. The fast-paced characteristics of the city, along with the metro, made me beyond elated because it made the city seem small and large at the same time. Leaving Monday evening was practically devastating. Friday afternoon was the beginning of the Gala weekend. Beginning the day with a cooking demonstration from Domenica Marchetti, my mom and I watched as she made one of my favorite foods from my time in Italy: tajarin, which is the Piemonte version of tagliatelle. The pasta noodles are egg-yolk-rich, have a lovely yellow color, and go great with truffles or mushrooms. After walking around D.C., my mom and I got ready for the NIAF Friday Night Kick-Off Celebration. The cocktail party, which had an extensive silent auction, featured many Italian cocktails and my FAVORITE wine. When I saw that they had Dolcetto d’Alba at the bar, my excitement went through the roof. Full of bold and rich flavors, the wine was direct from Piemonte and it reminded me of my amazing time living in Italy. The party was MC-ed by Joe Piscopo, who surprised me with his impressive music skills. Joe Matarese from America’s Got Talent killed it with his comedy set highlighting everything from Italian Grandmas to Non-Italians. World-famous accordionist Cory Pesaturo, Lena Prima, and Deana Martin all performed to the pleased crowd, and made the night one to remember. Saturday was by far the busiest and craziest day of the weekend. The Expo Italiana was in full swing, where I worked at the NIAF welcome booth. I got to greet guests, raffle off prizes, and give attendees information about the Expo. The Expo had food, wine, coffee, and products from all over Italy. NIAF called the event “a vibrant marketplace and forum for all things Italian and Italian American.” Mike’s Deli, Lavazza Café, Peroni, Cibo Foods, Ferrero, BIVI Vodka, La Famiglia DelGrosso, Dolce Gelato, Alitalia, Maserati, and Regione Piemonte were the featured products and brands at the Expo. Guests could learn about and enjoy these products with other Italians and Italian Americans throughout the day. The Expo also had a Bocce Ball court, movie screenings, and special forums that talked about everything from the future of Little Italys to the process of getting Italian citizenship. I worked at the NIAF welcome booth and interacted with attendees until the Q&A with Anthony and Joe Russo started. The Russo brothers, who were being honored at the Gala, are the directors of Captain America: The Winter Soldier, Captain America: Civil War, Arrested Development, and Community. 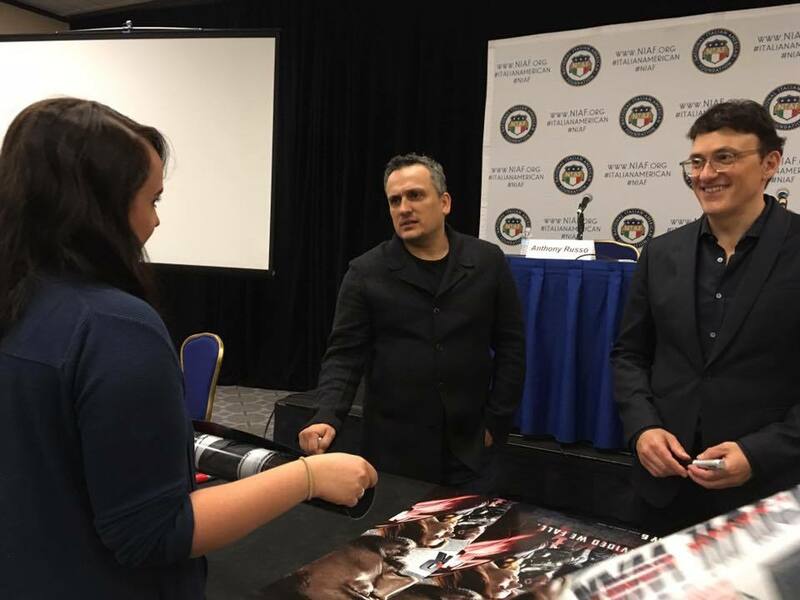 Being a huge Marvel fan, I attended the forum and got to ask the Russo brothers a question. It was inspiring to see the men who have helped define my self-proclaimed nerdiness be so open and willing to talk to people who share a cultural bond with them. After tearing down and cleaning up the Expo, running to my room, getting Gala-ready in 15 minutes, and rushing back to the hotel where the Gala was being held, I was put at my post. As a greeter at the event, I was able to meet attendees and explain the layout of the Gala, as well as help guests to their seats. Despite the fact that my dress ripped 15 minutes before I was set to be at the Gala, I was on cloud nine because I finally got to attend an event that I had heard about for over two years. The Gala dinner itself went off without a hitch and it was one of the coolest experiences ever. 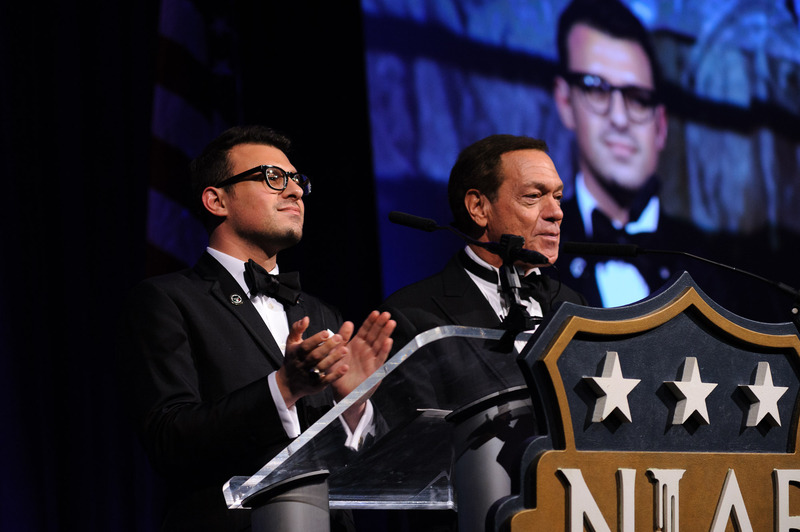 Joe Piscopo returned with the NIAF President and COO John Viola to host the event. The Italian Ambassador, Armando Varricchio, opened the event with a tear-inducing speech, which thanked NIAF and its supporters for the more than half a million dollars that was raised in response to the August earthquake that hit central Italy. He expressed his gratitude and the ability of the Italian and Italian-American community to really make a difference. What really got me was the video honoring Piemonte. Seeing the place where I lived and dearly missed made all my happy memories rush forward. The food that was served that night highlighted the uniqueness of the region and its emphasis on truffles and beef. The food and wine that was served showed how wonderful living and eating in the region was as well. 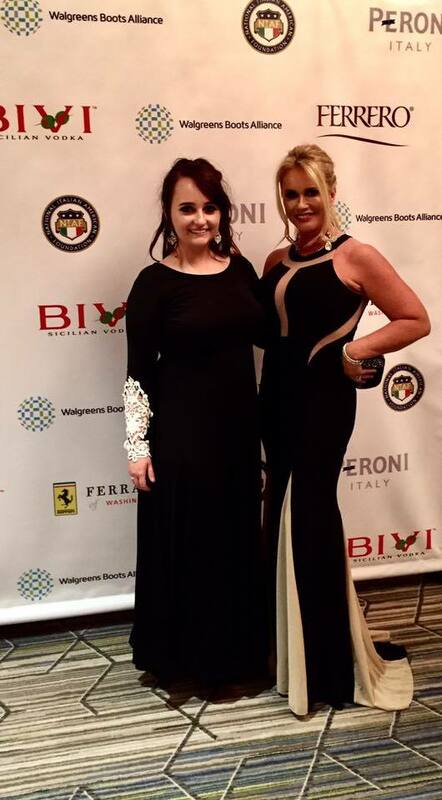 The Gala honored many impressive Italian-Americans throughout the night. While accepting their award, the Russo Brothers announced the launch of a new NIAF program, The Russo Brothers Italian American Film Forum. This is a new grant and scholarship initiative that will help fund young Italian-American filmmakers in their efforts to break into the industry and capture what it means to be Italian-American. The crowd was also told about the NIAF’s scholarship programs which in 2016 gave out 180 scholarships, all totaling $950,000. It was an honor to be at the Gala and hear about the scholarship programs because I have received scholarships from the National Italian American Foundation a total of three times. That night was one that will stay with me forever and I was so grateful for the opportunity to finally work and attend the Gala. Overall, D.C. and the NIAF Gala were amazing to me. There’s nothing in this world that I’ve done so far that can compare to this experience. If you’d like to learn more about the NIAF click here. If you’d like to learn more about and apply to the NIAF scholarships click here. If you’d like to learn more about and apply to the NIAF grants (The Russo Brothers Italian American Film Forum will be up on the website within the upcoming months) click here. You can check out Haley’s blog post on her entire weekend in D.C. on her personal blog, To Go With Love. Image | This entry was posted in Blog, Culture, Italian, Italian American, Italy, NIAF, Uncategorized and tagged Captain America, Gala, Gala dinner, Italian, Italian American, Italian Ancestry, Italian Heritage, Italian Pride, Marvel, National Italian American Foundation, NIAF, Russo, Russo Brothers, The Avengers. Bookmark the permalink.